It is my honor to nominate Desiree Lurie for The Hospice Caregiver of the Month Award. 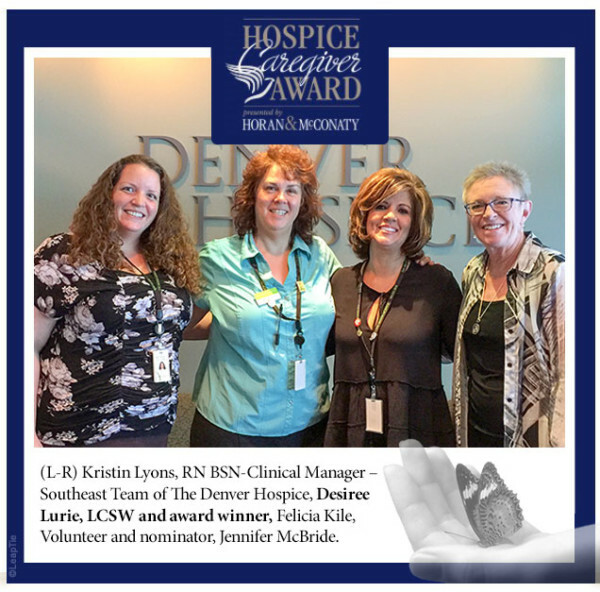 Desiree’s working title is “Social Worker” for The Denver Hospice but she is more like a “Guiding Light” full of WARMTH, HOPE and LOVE. I am a volunteer who shares the care of a patient with her. For the last year I have not only observed, I have experienced her kindness, compassion and dedication. Desiree treats our patient and her family like they are her only priority, her only patient, while in reality Desiree continuously cares for 37+ patients along with their families at various stages of life. Desiree began the Hospice Journey with our patient and her family approximately a year and a half ago. Our patient has dementia, is non-verbal and her family does not live in the area. Desiree is truly her “number 1” advocate, continually assessing and reassessing her situation as her needs change. Desiree gently helps with the small details as well as assists with her “Guiding Light” full of WARMTH, HOPE and LOVE through the more difficult decisions. Our patient lives with respect, dignity and grace because of Desiree. When there has been a problem Desiree’s persistence, character and heart shine like no other. Desiree’s personal working responsibilities are vast but she is also an integral part of a team. I have contacted Desiree many times over the last year concerning our patient. Regardless of my questions or concerns Desiree always takes prompt and appropriate action with the same level of urgency to rectify all issues. Desiree continuously goes above and beyond for our patient making sure all of her needs are cared for while never losing sight of the larger specifics for her and her family. Desiree exudes compassion, she is beyond kind, Desiree, is the consummate caregiver!